Planning and urban design, policy development, PlanGreen. 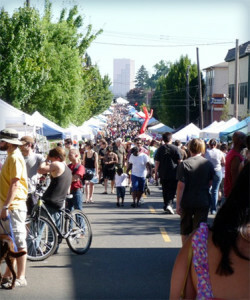 The Mississippi Avenue Street Fair in North Portland promotes local merchants. PlanGreen can help enhance your reputation as a sustainability leader. PlanGreen can help you create policy and programs to make your community more livable, prosperous and climate resilient. PlanGreen can help you leverage sustainability tools such as LEED for Neighborhood Development (LEED ND), Code Reform, Missing Middle Housing, Living Building Challenge, Impact Investment and other Smart Growth tools to your best advantage. It was a pleasure working with Mary on the Clark County Highway 99 Subarea Plan. As an auto-oriented 50’s era commercial strip that was replaced by Interstate-5, it was a challenge to create a path forward that mirrored the community’s desire for change. In developing a Sustainability working paper for the Highway 99 Sub Area Plan (TR 14), Mary went far beyond throwing in a few LEED building and electric vehicle plugin recommendations. Her emphasis on a form-based code and new parking regulations showed that she understood sustainability at a deeper level. Her efforts cemented that path forward. The Highway 99 Subarea Plan was approved by the Clark County Board of Commissioners along with the first form-based code in southwest Washington. For more information, visit www.clark.wa.gov/hwy99.